The CoffeeShop Blog: CoffeeShop Vintage Digital Papers 5! CoffeeShop Vintage Digital Papers 5! Today is a rare rainy day (swoon, after weeks of dry hot days in the 90's it is heaven), so we are inside organizing/rearranging a few of the rooms in our house. It is a huge process and I will be blogging about it later. But it will be fun to have things the way we want for a change! 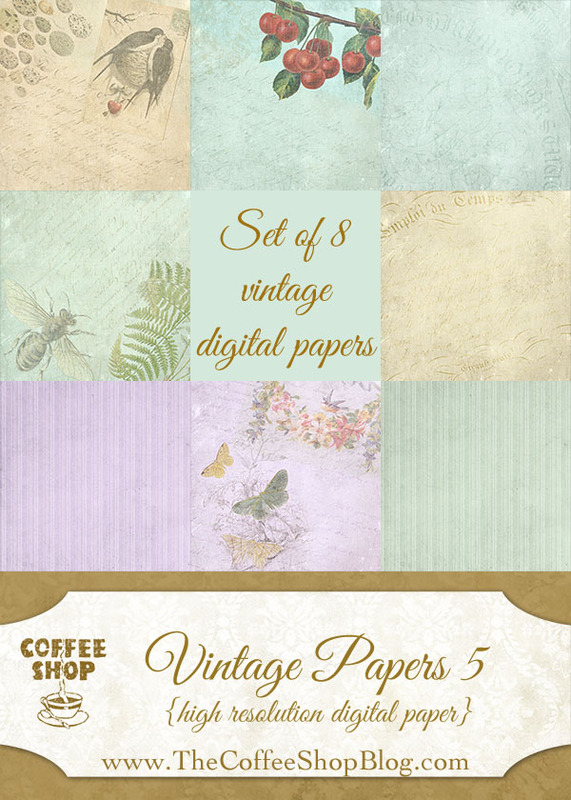 Download the free CoffeeShop Vintage Papers 5 set. You can also download it here. Love how your dotted paper looks on your background here. Thanks a bunch for the digital papers. Thank you! I especially love the butterflies and the bee with the fern. Thank you very much, your papers are really pretty. Thank you I love them! Just exceptional, thank you. How do you find the time, speaking of time. Any possibility you would consider revisiting making your own header and background on a Blogger Blog?? Thanks for all of the freebies, and the pleasure of listening to the adventures of Duke and Imp. Always makes me smile. Wanted to say thank you for the beautiful papers and I have used one for a post on my fb page and have credited you so that others can come back to your blog and enjoy it also. Beautiful papers, thanks for sharing.